For Airtel Digital TV (DTH) subscribers, this is your cue to subscribe to Live TV on the move. This is the third direct-to-home television service provider to start such a service, and the effort is quite impressive. The app is currently available only for Android devices only. The quality of streaming depends a lot on your internet connection, and with everything in order, TV channels are perfectly watchable. The app interface isn’t the most exciting, but the good thing is that it is largely clutter-free. Airtel offers 150 channels on the app, which is more than what any of the rivals offer. Right after Dish TV (DishOnline) and Tata Sky (Everywhere TV) started their Live TV streaming service for smartphones and tablets, the other major Direct to Home (DTH) player, Airtel Digital TV, has launched something similar. 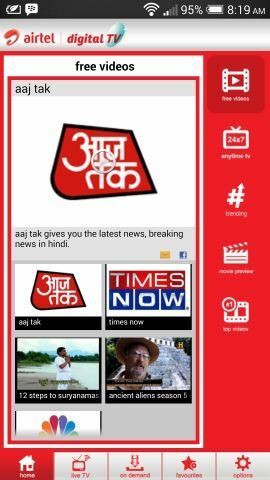 The app is called Airtel Pocket TV app, and is currently available for existing and new DTH subscribers, who are using an Android smartphone or tablet. 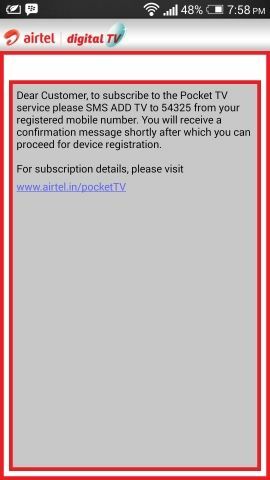 Airtel’s Pocket TV app is a separate application that you need to download on an Android phone or a tablet. The service is not integrated within the existing MyAirtel application. Dish TV had also introduced DishOnline as a separate application, while Tata Sky had integrated Everywhere TV within the Tata Sky Mobile application. Depends on what you find convenient, but Airtel really had no option, because MyAirtel is the app that also manages mobile accounts, for example, and that would lead to a massive clutter within one app. The first time you open the app, you will need to sign-in with your Airtel Digital TV customer ID or registered mobile number. 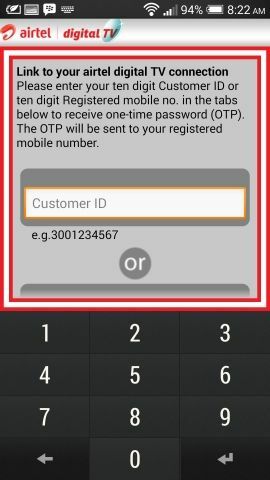 This will take you to step 2, which would ask you to type in the One Time Password (OTP), which Airtel will send you on your registered mobile number as an SMS. Once this is done, the service will get activated on your account, for this particular device. The same process will have to be repeated on another device you may want to set up with Pocket TV. The color theme combination of red and white is pretty much trademark Airtel. That is how their online portal works and that is how their paper bills are. The home screen of the Pocket TV app shows you free videos from a bunch of channels. 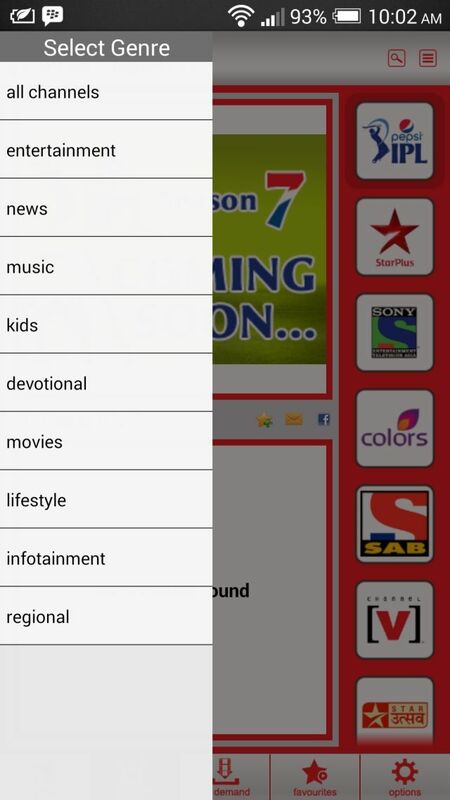 On the right side is the vertical menu, which lists the value added features like Anytime TV (catch-up TV), trending programs, free videos, and movie previews. On the bottom are the options for Live TV, On-Demand videos and where you can access favorites from. All the options are laid out neatly, with the combination of vertical and horizontal main menus on each screen offering every option at one tap. Within different sections of the app, the vertical menu on the right of the screen changes with options necessary at that point of time in the navigation. While the current design is undoubtedly more than usable and fairly intuitive, it doesn’t feel like a high-quality app particularly on a smaller smartphone screen. And while that may not bother most users, it is something that you would expect Airtel to do well for an app that is going to be a pretty big deal going forward. Slightly shiny graphics would do better, something like how Tata Sky packaged the Everywhere TV service. Live TV - This is the main point of the entire exercise of paying for and using this app anyway, and I am very happy to report that the experience is extremely good. What you need is a Wi-Fi or a 3G connection at a fairly decent speed, and the streaming quality is smooth. The quality is managed automatically, depending on the detected bandwidth. For a smartphone or a tablet screen, this is more than sufficient quality for streaming most content. Streaming on an 8Mbps Wi-Fi connection is smooth. Tap on a channel icon, and it takes around 3 seconds for the video streaming to start, and another couple of seconds for the picture quality to settle. Tata Sky offered manual control over the maximum streaming bit-rate and the subsequent picture quality, but I couldn’t find such a setting in Pocket TV. For usage on 3G, the streaming quality would completely depend on connectivity and speed at that time. Airtel is offering 150 channels on the Pocket TV service, at the time of launch. 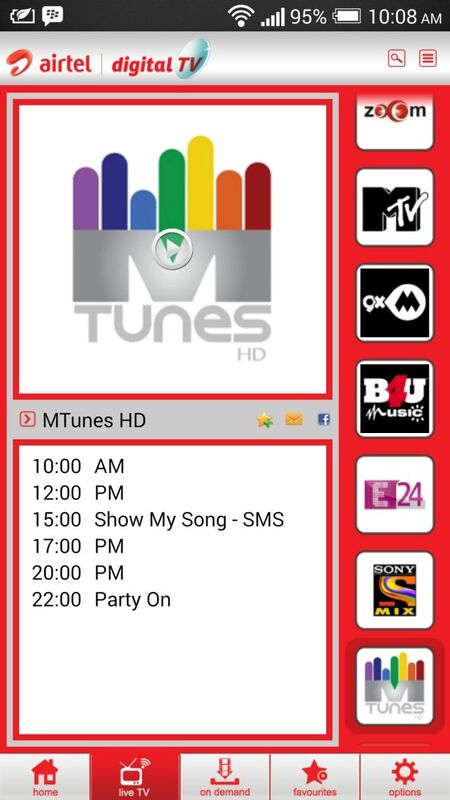 This is much more than what Tata Sky’s Everywhere TV and Dish TV’s DishOnline service offer. And the cost of Rs 60 per month is the same as what Tata Sky charges for the Live TV streaming service. However, the Airtel Pocket TV service does not have any sports channels available on the app as yet, and that puts it at a significant disadvantage. Both Tata Sky and Dish TV offer certain sports channels, if not all (mostly the TEN network channels are available, with Star Sports channels missing at the moment), and that is a real value add for certain subscribers. But, if you aren’t bogged down by that particular point, the service makes up for it across the other genres of channels. The On-Demand service on the Airtel Pocket TV app offers a library of movies across various genres, and is powered by BigFlix. And the best part about it is that the entire library of movies can be streamed without any additional charge. For Rs 60 per month of Live TV streaming as well as a massive movie library in the on-demand section available, this is not a bad deal! Quite frankly, Airtel Pocket TV app offers a lot of flexibility and convenience, making your smartphone an alternative screen to view TV on. There are no HD channels on the platform yet. Keeping bandwidth costs down, seems to be the likely reason for that. It pretty well solves the debate when you may have just one TV at home, and two people may want to watch different things! Or when you may be traveling, but still want to watch some TV. This service is currently available for Android smartphones and tablets only, and if you are an Airtel Digital TV DTH subscriber, this is a good service to add on to the basic DTH package.